Создание фонда | "ПОВЕРЬ В МЕЧТУ"
Charitable Foundation “Believe in the dream”- development of creative potential of children with disabilities, orphans, children from multi-child and needy families. O Lord, grant that I may not so much seek happiness for myself, to be consoled as to console, to be loved as to love, to be understood as to understand. Everybody knows that it is quite impossible to enroll as a student to a university or art school without basic art education (as in any other art sphere). It should be some knowledge base or some schooling in that sphere. Children from orphanages and residential care homes don’t have such opportunity. All that they can be offered to become a barber, cook and etc. But HOW MANY REALLY TALENTED IN ART children are going out those educational institutions! It is possible, that one of them is New Repin or New Aivazovsky, isn’t it? Lot of Charitable Funds find gifted children and help them in their future. Thanks a lot for such Funds! But they work only with strongly pronounced talents. How does about other children? What do they can do? That is how we came up with idea of Mobile Art School. Such school could come to orphanage, residential care homes, hospitals and do in-home services with all necessary facilities and resources. Professional teachers – artists, musicians, actors and other art teachers – could give regular qualitative lessons for children. It all will be done as if it is in conventional art schools, studios or workshops. It is up to children decide do they want to continue their education in some art institute of higher education or just keep art as a good hobby for their future lives. We should give a chance for each child! There is the same situation with children with disabilities. They have no opportunity to study in art schools, because classrooms should be equipped in the different way as for the other children. 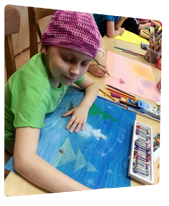 Our Fund wants to create special work-rooms for children in that they can feel comfortable. We want to create placing due to all normative standards. Drawing easels and other facilities will be made as a custom-build. We want to have personnel who always stay in touch. All teachers must conduct a class with comfort. One of our tasks is to give lessons for acoustically challenged children. Such lessons will be attended by sign language interpreter (if necessary). Further we are planning to create Art College for students with disabilities. Also we want to come at hospitals and hospices… Our classes for children should be individual. We BELIEVE that we can do EVERYTHING! And we know how to do it! When we can do EVERYTHING for children in need!